[Activate] 【R】: [Counter Blast (1), move this Unit to Soul] If you have a 《Kagerō》 Vanguard, retire 1 of your Opponent's Grade 0 Rear Guards. To wrap up the week, we bring you Gattling Claw Dragon, the draw trigger and honestly probably one of the most useful triggers in the game. Basically at the cost of 5k in shield and a counterblast, you can retire a unit in your opponents back row(Grade 1). Considering this is the purpose of Kagero, to eliminate the field, and that some of their units even gain boosts from having rearguards retired(mostly during main phase). This can be extremely useful, again especially because its only a 5k shield you're sacrificing unlike most triggers with these extra effects which are 10ks. I don't really have much else to say, its an amazing draw triggers that removes your opponents Grade 1 rearguards for a pretty low cost. I'd say 4/5 on this one. Honestly having a hard time not ranking it higher. 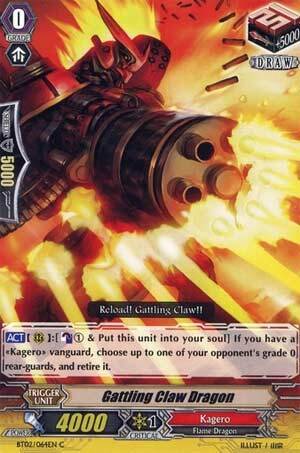 Gatling Claw Dragon is definitely an excellent Draw Trigger to have in your Kagero deck especially seeing it's the only Draw Trigger in the clan with an effect; you can put this card into your Soul and Counterblast 1 to retire any Grade 0 unit on your opponent's field. Now while that may sound bad at first because it can only hit other Grade 0's, think about it for a second. This card's main purpose is to get rid of a Pioneering starting Vanguard with an annoying ability like Wingal Brave, Crimson Lion Cub, Kyrph, etc. For s decent portion of decks, if you get rid of their Pioneer starter before they get a chance to activate said skill, then it'll put the deck on stall for a turn or two which makes an excellent opening to deal out some pretty major damage. I think one thing that should be noted is that, out of all of the Triggers it could've been, it's a Draw Trigger which is probably the best trigger you want to see this card be! Why? Think in a defensive perspective; you'd technically only lose a 5000 point shield while, if it were any other trigger, you would've lost a precious 10,000 point shield! That a Draw Triggers are used in a majority of Kagero decks nowadays, so this would normally take over that spot no problem! Overall, this card is such an annoying nuisance but an excellent card for that very reason. I value a trigger that does something outside of the drive or damage check. Gattling Claw is very much not an exception. For a counterblast of one, and putting it in the soul, you can retire a grade 0 unit your opponent controls. In my opinion, this guy’s skill is more worth investing in than Kimnara’s, since some of the more dangerous (in the long run) units are grade 0. Royal Paladin’s Wingal Brave comes readily to mind. Popping their most consistent option for getting off their MLB combo is huge. As a matter of fact, most clan starters are generally something to pop if you can manage it. Things like the afore mentioned Wingal Brave, Lizard Soldier Conroe, Spring Breeze Messenger, Mecha Trainer, and the new Officer Cadet Erikk are all units that raise the consistency of their respective clans, and are painful to lose without getting to use their skills. In Kagero decks, this should be the first draw trigger you add to the line-up, if you are playing a deck with draw triggers. The usefulness of the skill far outweighs the 1k less power than vanilla draw triggers offer. Rating: 5/5 – I didn’t even go into its essentialness in a Blazing Flare Dragon centered deck.